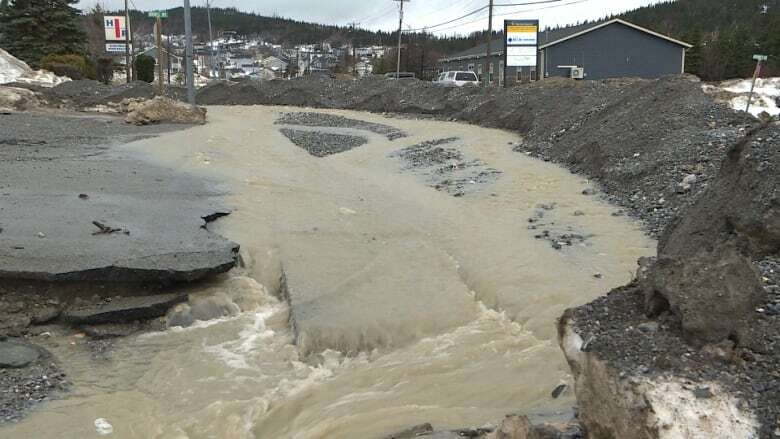 It's been a year since heavy rain devastated communities on Newfoundland's west coast, and town leaders are still looking for permanent infrastructure repairs. It's been a year since heavy rain and melting snow cascaded through communities on Newfoundland's west coast, flooding homes and cracking roads in half. Most communities and towns applied for financial assistance through the province's disaster relief funding, but many mayors say the money only covered Band-Aid fixes and no permanent repairs took place. In Deer Lake, large sections of the riverbank crumbled into the water when the Humber River filled with rain and chunks of snow, pushing land with it. Now, when there is a rainfall, people's backyards shift with the earth. "The last rainfall, we had a couple spruce trees that were hanging on. We lost them in the last month. It is continuing, the erosion," said Mayor Dean Ball. "The bank is scraped off to the sand and gravel, so each and every time there is a major rainfall, it's still continuing." With some disaster funding along with capital works money, the town plans to install strong armour stone along the riverbank this summer to reinforce the crumbling land, at a cost of $1.5 million. The mayor says it was a long process to apply for relief funding with the province and he's not certain the stone wall will hold up for years to come. "With the way weather, climate is changing, it's a guess, you know. We're hoping. Our engineers, we have been working very closely with, and we are hoping this is going to be a long-term fix," said Ball. 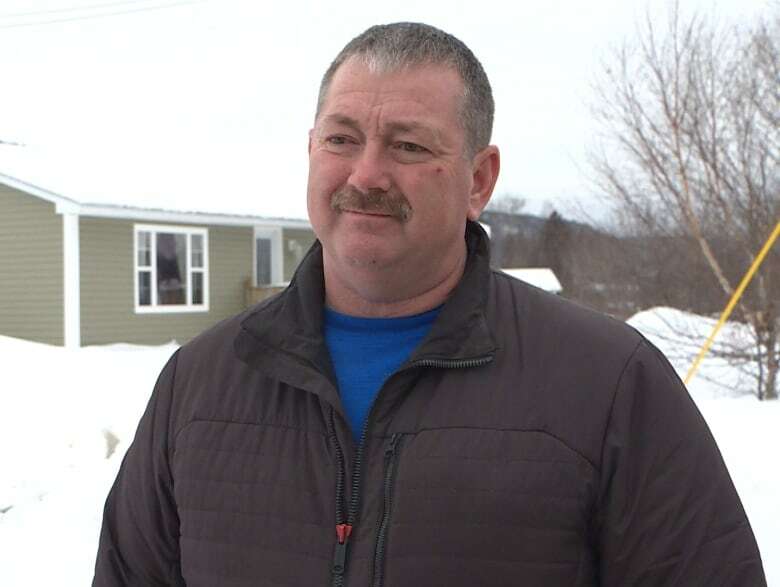 In Trout River, some residents are worried the rebuild that's underway won't fix the problem, because they say two levels of government aren't doing the needed work at the same time. The heavy rains washed an enormous amount of gravel into the river last January, altering the river's depth and the way the water flows. That's still having a huge impact in the community. "[Our fish harvesters] couldn't even come in to our harbour to sell our fish. 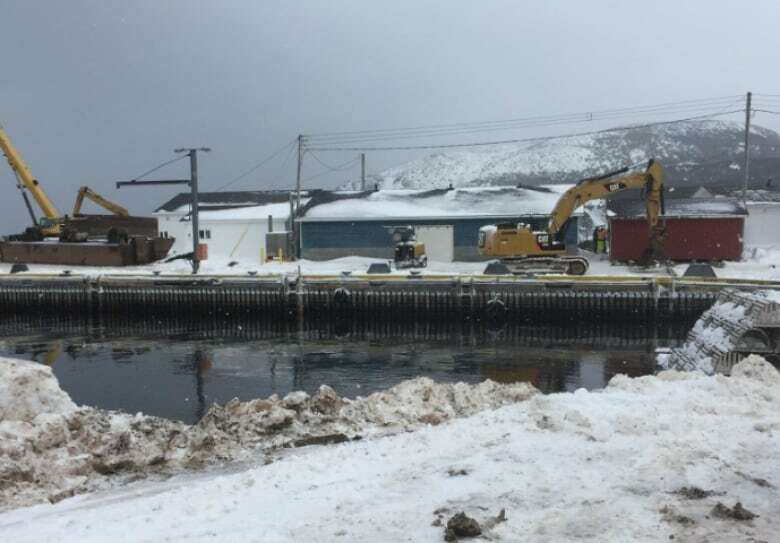 We had to moor up in Woody Point, so this year it's looking like we're probably going to be doing the same thing," said Bonnie Brake, chair of the Trout River harbour authority. "We will have a new wharf but we're not going to be able to access the river because the water is going to be too low." Brake said the dredging on the lower part of the river that's being done now, with funding from the federal government, "is a waste of time and money" if the provincial government doesn't step up. 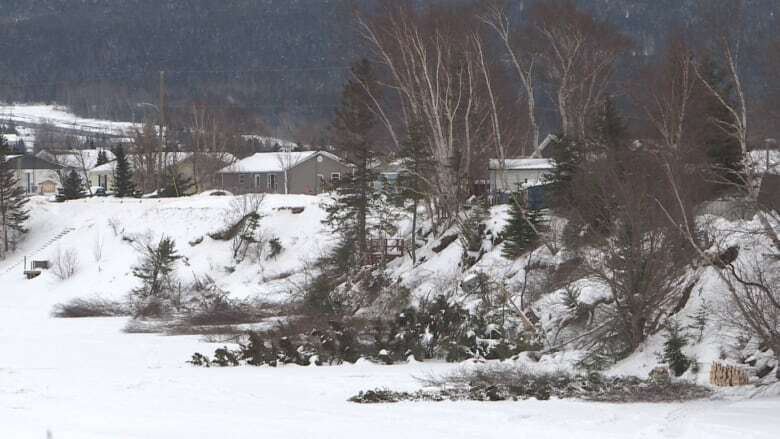 She said the town of Trout River has filed an application with the provincial government — under disaster relief funding — to get money to dredge the upper part of the river. "Whatever is upstream is going to come back down and fill in.… it's not even logical," she told CBC Radio's Newfoundland Morning. "The time to do it is now, not months down the road," she said. Community leaders south of Trout River have similar concerns with water flow repair and infrastructure after January's floods ripped open roads and destroyed stream culverts. 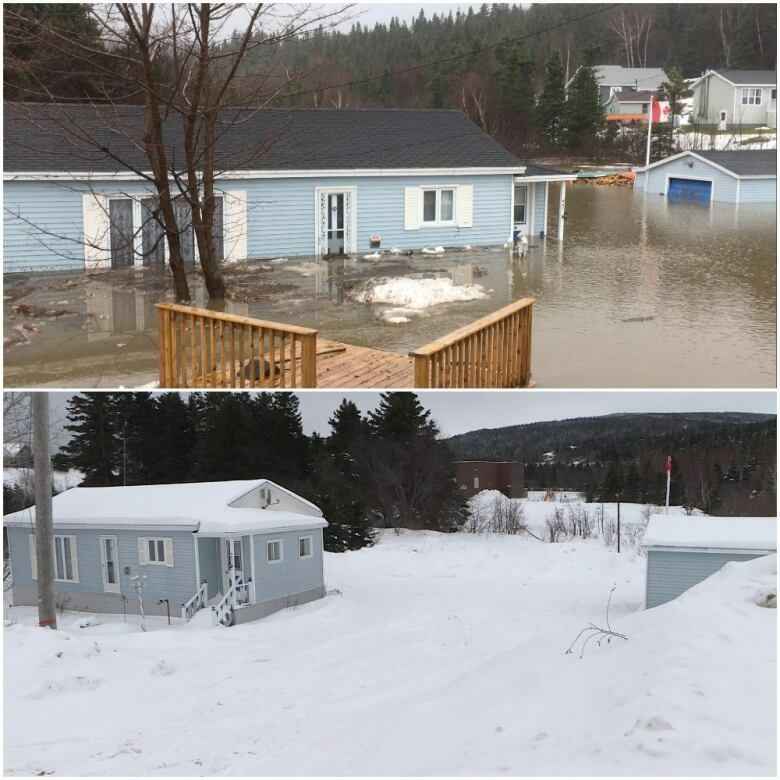 Clarke's Brook in Benoit's Cove could not handle the influx of rainwater and melted snow. Water pushed across streets and the school parking lot, and flooded one home to the roof's eaves. "Inside is nothing but a disaster," said Daryl Jesso, whose parents lived in the home. "It's covered in mould. It's done." His parents were able to salvage only a few memories. "Just a few things up high, a few videotapes years ago, a few memories, dried out some pictures, but that's it," he said. It's taken almost the entire year since for the Jesso family to settle their claim with the disaster relief fund. The house has to be torn down, and the land is not fit to build on. The town tried to fix the nearby brook, so more flooding wouldn't take place. "We dug out the brook. We put stuff up on the sides," said Mayor Glenn Savard. "It's going to founder again. It's just a matter of time. We asked for armour stone and stuff but we were denied that." The province started a disaster financial assistance program in response to the flooding, but the fund could provide money for repair work only to pre-disaster conditions. "Compensation for damages caused by the recent flooding is based on criteria established by both the federal and provincial disaster financial assistance programs," says a statement from a provincial spokesperson. "Only costs associated with repairing or restoring the area to pre-disaster conditions are eligible under the Newfoundland and Labrador Disaster Financial Assistance Program." The statement goes on to say there are provisions in the financial assistance program to allow for a 15 per cent improvement above what was already in place previously. But in bigger areas like the City of Corner Brook, financial assistance from the disaster relief fund came in way under what was expected. "We applied for a significant amount of money, I think it was around $2 million, and that reconstruction hasn't been completed yet. We ended up getting about a quarter-million, as it turned out," said Mayor Jim Parsons. Corner Brook declared a state of emergency after roads were washed out and stream levels rose dangerously high. "We had boulders out in the road," he said. "And we had flooded areas where you could trap additional people at any time," he said. The smaller chunk of funding will go towards permanently fixing ditches and side roads this coming construction season. The Department of Municipal Affairs and Environment told CBC it received 123 private sector claims for disaster relief funding and paid over $2 million to private sector claims and over $427,000 to municipalities. The government claims all repair work is complete in six communities on the west coast while 19 other will be completed with repair work to pre-disaster conditions by this year.